Congratulations to H5C’s Be a Millionaire Day Winners! 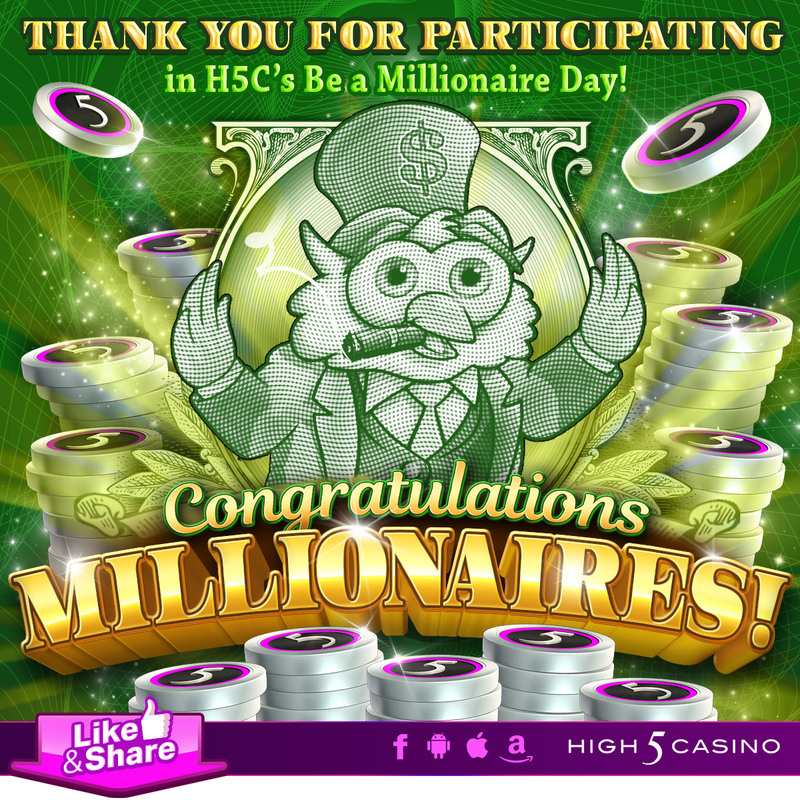 On Sunday, May 20th, High 5 Casino celebrated “Be A Millionaire Day”! High 5-ers were encouraged to spin any H5C game as often as they would like. For every one-millionth spin on the reels of any H5C slot game, the one-millionth spinner would be selected to win a million coins or more! Once someone won, the counter would reset, giving more players the chance to win! Make sure to check if you are one of the 45 lucky winners today in the list below! All winners have received a million or more FREE High 5 Casino Coins, which can be redeemed in their casino lobby! Congratulations to all the winners! This entry was posted in H5C Contest, High 5 Casino, High 5 Games, Player Spotlight and tagged Android, App Store, Apple, Be a Millionaire, Be a Millionaire Day, Facebook, free coins, Free Games, Free One Million Coins, Google Play Store, H5C, H5C Promotion, High 5 Casino, High 5 Casino Mobile, High 5 Games, iOS, iPads, iPhone, iPhones, Million coins, Millionaire, mobile gaming, Player Spotlight, social gaming by hoothigh5. Bookmark the permalink.